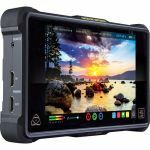 The A7S 7" Full HD Monitor with black rubber case from Lilliput features an HDMI 1.4 input, making it suitable for UHD 4K filmmaking and photography. The A7S 7" Full HD Monitor with black rubber case from Lilliput features an HDMI 1.4 input, making it suitable for UHD 4K filmmaking and photography. With a 16:10 aspect ratio and 1000:1 contrast ratio, the LCD panel displays Full HD images. The HDMI loop-through function allows you to output via HDMI to any other compatible device. If you have upgraded to the 4K workspace, the A7S offers control over your shooting workflow both in the field and studio. You can create shortcuts to your favorite and most used monitor functions using the two customizable function keys. You can mount the monitor onto your camera by attaching the included shoe mount adapter to the 1/4"-20 threads at the bottom. You can also use the VESA 75 hole at the back to attach the A7S to other mounts.